A fine drizzle has started and the crowd waiting on the street close to the Westminster Cathedral piazza in Victoria is slowly growing, even though the first run is not due for another hour. Clusters of eastern European men are quietly chatting. There are a lot of people standing alone wearing rucksacks or clutching plastic bags, pressed against buildings, trying to stay dry. Jacqui and Tommy are sitting cross-legged on the pavement. They seem an incongruous couple. Jacqui has been sleeping rough in London for a few months having fled Glasgow after breaking up with her violent partner. At times it is difficult for me to follow Jacqui’s guttural Glaswegian but it seems that she has been asked to leave a number of hostels and day centres because of her behaviour and was even banned from the entire Victoria area for a while and forced to move over the river to Vauxhall. She is unconcerned by this reputation for aggression and intends to continue sleeping rough as there is nothing for her in Glasgow. Tommy shakes my hand warmly. He has the nodding dog motions and unfocused eyes of the heavily inebriated. Tommy’s story is that he had a flat in Hackney but some unwelcome guests took up the floor-boards and did other damage which led to him having to leave. We are shortly joined by Deeta, a woman of Indian descent who enters the conversation by noting that she ‘scrubs up well’ despite having to sleep rough. She does indeed seem immaculately dressed and when she uses this phrase again later in the conversation, it leads me to wonder if she is really living on the street. The soup runs attract a wide range of individuals with different needs for whom this congregation of people offers company and the opportunity to act out a role in a dramatic setting. It seems that, perversely, mass destitution brings with it a certain allure. Deeta talks about a family home in Belgravia and a husband who has thrown her out. Her discourse becomes increasingly obscure. She speaks as if we are confidantes who have a special understanding of life’s mysteries and I don’t feel able to confess to her that for large parts of the conversation I am hopelessly lost. Next on the scene is David, neatly attired in a suit and tie and holding a book of poems which turn out to be his own poems. He is no longer homeless himself and is part of a church - the Church Without Walls - which dispenses soup periodically on the Cathedral piazza. I make the mistake of asking him where his church is based. ‘Nowhere and everywhere’, he tells me. The others in the group chortle at my error, pointing out that the answer lies in the name. But now there is a burst of activity, a car has arrived and the scattered groups of people are coalescing to form an orderly queue. The Church of the Sacred Heart is here, having driven in from Wimbledon. They have been dispensing soup, tea and food in Victoria for many years. Slowly the queue shuffles forward, each person receiving tea and sandwiches from the volunteers. The Church of the Sacred Heart has still to complete its work when a further commotion announces the arrival of the next soup run. Volunteers from the Coptic Church have arrived in two cars and groups have gathered around the open boots of each. Bags are dispensed to each person containing a sandwich, non-alcoholic drink, piece of fruit and packet of crisps. The Coptic Church volunteers think I am one of the homeless. They thrust a bag into my hand and invite me to join them in singing songs of praise, due to commence shortly outside the nearby Café Nero. On introducing myself we discuss the proposal, backed by the influential Soup Run Forum, that soup runs should no longer operate in the vicinity of the cathedral piazza in order to bring respite to local people living in an area visited by soup runs for over twenty years. The Coptic Church is sympathetic to this request. They understand the issues for the local community and are mindful of the possibility of a byelaw being imposed if a voluntary, self-regulating solution doesn’t prevail. They assure me that this is the last time they will be dispensing food and soup near the piazza and next week will find a new site, indeed may even move to an indoor location. There has been much debate about the role of soup runs. The threat of a byelaw to prevent the distribution of soup and other handouts in the cathedral area of Westminster has led to passions running high. Liberty, which is campaigning against the proposed byelaw, has adopted the slogan ‘no one sleeps rough for a free sandwich’. It is a slogan which is bafflingly inconsequential. The shared view on both sides in the debate is that the majority of people attending soup runs are not rough sleepers and the causes of rough sleeping are many and complex. From the point of view of the soup runs, their worth is evident through the size of the crowds that gather to receive the food and drink they dispense. And it is true that, on the night I was in attendance, by the time the first soup run showed there were over 60 people waiting patiently for its arrival. The soup runs believe they provide essential sustenance for people with few resources, as well as companionship. Their work is a visible demonstration of compassion. And as for the faith groups that comprise the majority of the soup runs, they are undertaking a sacred duty to minister to the poor. For those of us viewing the scene figuratively and literally from the other side of the road it is the irrationality of the soup run response that is bewildering. 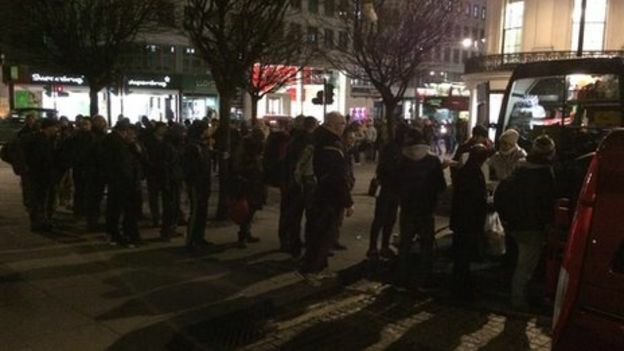 Why can’t the soup runs operate from within a building where help can be given that goes beyond the provision of food and drink, on matters connected with health and access to accommodation for example, rather than requiring people to queue publicly in locations open to the elements? And why do soup runs wish to travel into central London, often from considerable distances, when there are issues of poverty and homelessness that need tackling in their own localities? Night is drawing in and I’m thinking of heading home when I recognise one of the local residents resolutely winding her way through the soup run crowds. We discuss whether, in her eyes, there has been any change to the scene that she has witnessed over many years and I am not surprised to hear that the answer is ‘not yet’. After all, I have seen two soup runs in action myself tonight and I’m told by those who have gathered that another two are expected. I am reminded of the phrase heard frequently over the years from homeless people, that ‘you won’t go hungry in London’. She speaks of the mortification of an elderly resident who observed from her window a person who had just used a soup run openly defecating on the pavement. And it is a truth that must be universally acknowledged that where large numbers of people gather to eat and drink with limited toilet facilities, observable quantities of excrement and urine are likely to be in close attendance. A light drizzle has started up again as eventually I head off to catch a bus home. The groups are dispersing now and many people, like the soup runs themselves, have long distances to travel. It is bemusing that, like a flame attracts moths, this part of central London should draw so many people to it; not just the destitute, but those in search of them. I feel suddenly weary and demoralised. There is a fascination in meeting so many strange and intriguing individuals at the soup run. The sheer drama of the scene and its compelling actors is seductive. But this is the summer of 2011 and I have witnessed the mass feeding of the poor on the streets of central London. There has to be a better way. So tell us what the better way is Jeremy? This isn't a homeless rough sleeping issue, this is a food poverty issue, and it's happening everywhere - the fact people go to Central London is due to the following of the gravity of poverty - not for the added drama of a London backdrop. What is YOUR solution? Westminster won't help with indoor places whilst pretending they want to do... and soup runs ain't got the backing to raise the thousands necessary to pay rent in order that we may feed people indoors and than kick them out to sleep in the streets as your high and mighty councillor amigos may wish. What is YOUR solution? Banbanban as usual? Jon - thanks for your comments. I agree with you that this is essentially not an issue of rough sleeping but a fuel poverty issue. The solutions are actually coming from the soup run operators themselves. For example, Streetlytes is using King Georges hostel as a base for its run and is also giving housing assistance, helping people into the private rented sector. And the Simon Community are just starting a service for women using soup runs, operating out of a nearby women's hostel. I've been chairing a group looking at a voluntary, self-regulating solution to the issue of soup runs at the piazza and have been very impressed by the ideas coming from the soup runs. I'm not interested in a ban if a voluntary solution can be achieved. I do think there is a drama factor though. Why do runs come from areas where there are high levels of rough sleepers to give out soup in Victoria and what is the point of four soup runs turning up consecutively? Anyway, I think really good progress is being made and I also hope we can do more to link the soup runs in to other services such as outreach services.